Hello lovelies, it’s Miss Lady Lace here with my next fabulous video. Today I’m talking about the topic of motivation, which something I’m asked about very frequently, how do I stay motivated to dream big and make it happen? Running my own business as a burlesque performer, event producer, and pinup model on top of managing my YouTube channel and solely creating all my content for videos and social media requires a lot of work. Having the motivation to do it all is definitely something that’s difficult for even me, but today I’m sharing with you 10 fabulous tips to help you become more motivated. I think above all breaking down your motivations, what you want to achieve and giving yourself reason for what you do everyday is an essential step to success. If you have your own motivation tips please do comment them below as I’d love to hear them too! And if you’d like to see more videos of this style as well as the business and professionalism videos I spoke about please do let me know. Be sure to subscribe you never miss one of my vintage videos. 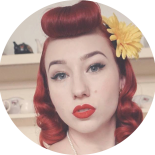 This entry was posted on April 4, 2019 by Miss Lady Lace in Pinup, Videos, YouTube and tagged 1940's, 1950's, blogger, glamour, miss lady lace, miss lady laces pinup blog, perth, perth pinup, perth pinup blog, perth pinup community, pin up, pinup, pinup blog, pinup blogger, pinup fashion, pinup girl, pinup life, pinup lifestyle, pinup perth, red lips, retro blog, retro girl, retro glamour, the perth pinup community, victory rolls, vintage, vintage blog, vintage blogger, vintage fashion, vintage girl, vintage glamour, vintage perth, vintage pinup blog.